WATERLOO – Wilfrid Laurier University will open its doors for its annual fall open houses on Friday, Nov. 6 at the Waterloo campus and Friday, Nov. 13 at the Brantford campus. Both open houses will take place from 9 a.m. to 3 p.m. The fall open houses will feature guided campus and residence tours, information fairs and many opportunities to learn about academic programs, admissions, financial aid, and student life. Laurier faculty, staff and students will also be on hand to answer questions. At the Waterloo campus, students and their families are invited to start their day at the headquarters booth in the Fred Nichols Campus Centre (FNCC), where they can meet recruitment staff, get directions and ask questions. The Student Experience fair begins at 9:30 a.m. in the same location. Students can learn about student support services, campus clubs, getting involved on campus, first year success factors and the admissions process. There will be an Arts and Science fair in the Science Building courtyard and a Lazaridis School of Business & Economics fair in the KPMG Atrium in the Schlegel Centre from 9:30 a.m. to 1:30 p.m. Students can experience Laurier's music programs first hand at the Faculty of Music open house in the Maureen Forester Recital Hall foyer. The Laurier Athletic open house invites students to view our state-of-the-art facilities and learn about interuniversity sports, OUA athletics and our recreational and intramural programs. 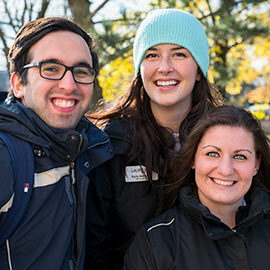 At Laurier’s Brantford campus, students and parents are invited to start the day at either the Carnegie Building or the Research and Academic Building, where campus tours will begin at 9 a.m. and run throughout the day until 3 p.m. Guests may also tour the Brantford campus residence buildings at their leisure between 10:30 a.m. and 2:30 p.m. There will also be hourly “University 101” sessions starting at 9 a.m. The goal of these sessions is to answer questions about Laurier and university life, provide resources and offer helpful tips. Program specific sessions, faculty drop-in hours and residence sessions will also run throughout the day. An information fair will be held from noon to 2 p.m. at Wilkes House Recreation Centre, where students can explore the variety of support services, student clubs, and athletics and recreation options that are available to them. For more information about both open houses, visit chooselaurier.ca/openhouse.